The product line, developed by the Phoenix-Design Group for Axor, was named after the health resort of Montreux on Lake Geneva, where the line premiered in 2006. 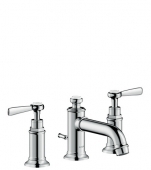 The faucets are in the style of the early 20th century and are inspired by romantic spas of this period. The industrial design is accentuated above all by the traditional cross handles and the porcelain plates. 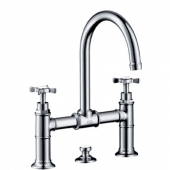 In addition, the faucets consist of individual assembled pipes as well as indicated nuts and there are nostalgic bridge mixers available. 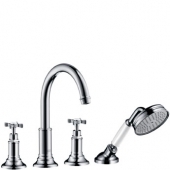 Nevertheless, modern elements such as lever handles and high spouts are also used, and the faucets of the Montreux line are of course state-of-the-art both technically and functionally. 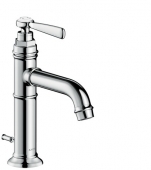 The Montreux line offers a wide range of washbasin taps. 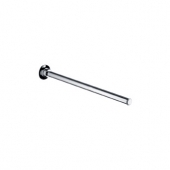 These include single-lever mixers in various sizes: 228 mm with lever handle and 174 mm with cross handle. These can have a classic form, with the foot and spout at right angles to each other, or a curved shape with the spout rising directly from the foot. 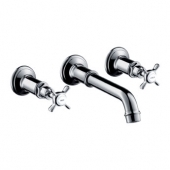 Two-handle faucets are also available. 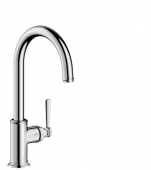 These have a rounded spout with handles on the right and left and have a size of 243 mm or 323 mm. 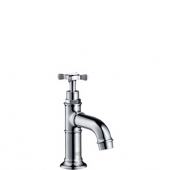 A more extraordinary variant is the bridge faucet, in which the handles are mounted at the top right and left. These are connected to each other via a rod and the spout is also located on this rod, which creates the special bridge construction. If you would like to combine nostalgia and modernity, you can choose the three-hole faucet. 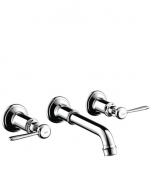 Here are all variants, which are also available as single-hole faucet: cross handles, lever handles, curved or distinctive forms with bell-like foot. 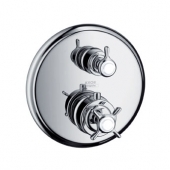 A three-hole faucet for wall mounting looks even more elegant. 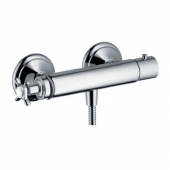 Montreux shower taps are available in either in-wall or surface-mounted versions. The in-wall thermostats consist of a round rosette on which the handles (cross or lever) and changeover valves are located. 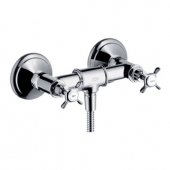 The in-wall mounted faucets show themselves in the classic elongated style with side handles or the tube style is extended, and the handles point forward. 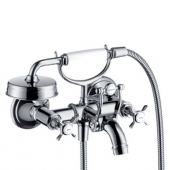 In addition to thermostats and mixer taps for operation, the line also offers shower pipes (complete with thermostat tap, shower, rod, hose and holder), shower sets (without thermostat or shower mixer) and hand showers. The style of the 20th century is consistently maintained and brilliantly implemented in the shower. Thus, the showers have a typical porcelain handle and the jet disc is covered by a metal jacket. The nostalgic charm is particularly noticeable in the bath faucets. Surface-mounted bath taps with combined shower remind of the first telephones which bring the historical flair to the bathroom. The free-standing faucet also adapts to this design. It stands on two feet (each on rosettes) and matches to a retro-look tub as well as to a modern bathtub. 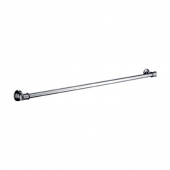 The four-hole bathtub or tile edge faucets are suitable for built-in bathtubs. 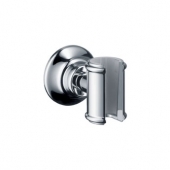 They have a bell-shaped body and cross or lever handles. The showers are also provided with a porcelain handle and a metal coat. 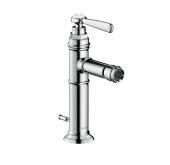 The bidet faucets can be selected in a nostalgic style in the two-handle version (180 mm high) with cross handle and round spout or in a modern style as a single-lever faucet (228 mm high) with lever handle and right-angled spout. 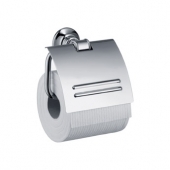 Both variants are available in chrome, nickel or other Axor colors and are equipped with a laminar jet. 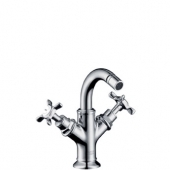 The kitchen faucets are all equipped with modern lever handle and are available in stainless steel or chrome. They have either a normal jet, laminar jet or a spray jet that can be adjusted and locked by pressing a button. 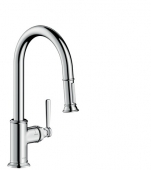 The kitchen taps can be turned between 110° and 150° or in three level: 110°, 150° and 360°. The pull-out spray also supports flexible operation on the sink. 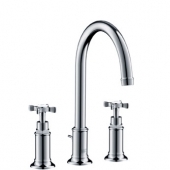 Montreux offers two types of kitchen faucets: a 396 mm high with a round design and the 622 mm high Semi-Pro. 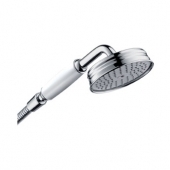 This even has a swivel range of 360° and it can be switched between shower jet and normal jet. 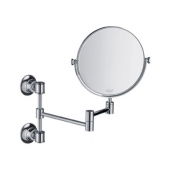 The accessories of the Montreux line, such as shaving mirrors, toilet roll holders, soap dishes and towel rails, are also kept in a nostalgic style. 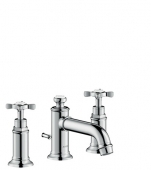 In addition to chrome and nickel, these are offered in the Axor colors and complement the traditional style of the faucets.